Whatever the size, scope or situation, CEG’s data center remediation experts have “been there, done that.” We offer the most comprehensive and diverse airflow management solutions available today. 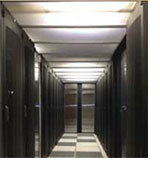 You’ve had your data center assessed and know where the problems lie. You may have even implemented a few changes on your own. Awesome! But there’s more to do and bigger benefits to realize. How do you start? Where will you find the time and manpower? Whatever the project, CEG’s data center remediation experts have “been there, done that.” Let us help you navigate through all the decisions (big and small) – hot versus cold, rigid versus soft, plugging all the holes, code compliance and green certifications. Understanding your environmental conditions is critical in making an intelligent choice when outfitting your environment. Just some of the factors to consider include budget, room size, altitude and available water sources. Protecting your data center from environmental factors may not be your highest priority, but it should be – 24 percent of unplanned outages are caused by weather, water, heat or CRAC failures. Most damage caused by dirt, dust, leaking water or chemicals is easily preventable. CEG will ensure your valuable equipment runs without impairment. Our critical environment experts are always available to discuss your needs and help you make informed decisions. In addition to remediation and installation services, we offer a full array of infrastructure, monitoring and DCIM solutions.